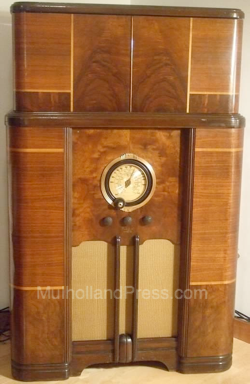 This is an apparently 1938-only style, containing the Philco 38-7X radio chassis. 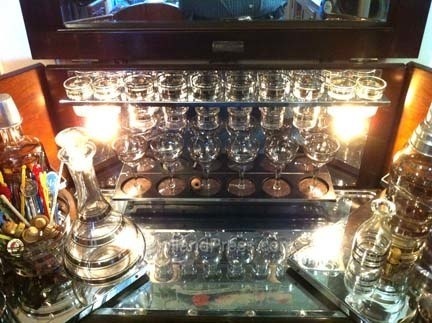 This style is noteworthy in that it is equipped with wine glasses in additional to the four standard glass types. This 1938 style did away with the metal bins and substituted a glass ice bucket. 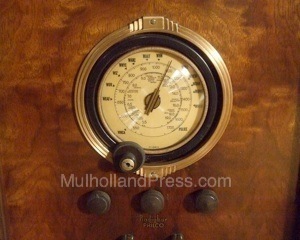 The official Radiobar model number is 60-7X. 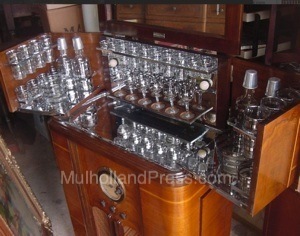 Bar equipment consists of four whiskey glasses, six 5-oz. glasses, six 5-oz. wine glasses, and eight each of the 10-oz. highball and Old Fashioned glasses. Additional items supplied were the glass ice bowl, an identical glass bowl for refuse, ice tongs, muddler combination, and four liquor decanters. Dimensions are 46 3/4" high, 30" wide and 14 3/4 deep when closed.